Writing of his experiences in the 1930's the author Neville Shute once observed that of the metalworkers and woodworkers who worked for him building aircraft, the woodworkers were universally jolly and the metalworkers miserable in temperament. There is much truth to this. 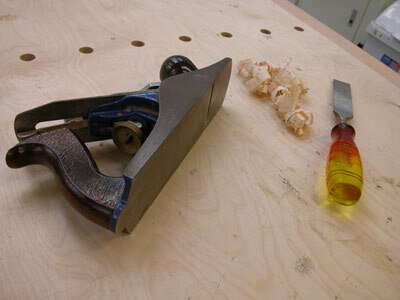 I love to work both wood and metal, but they are very different disciplines, especially when pursued with hand tools. We routinely expect to work to within 0.025 of a millimetre in metal. This is an unforgiving number, the thickness of a cigarette paper, a thousandth of an old fashioned inch. And every time we put a tool to metal it makes a nasty noise. Wood though makes lovely noises when worked and if we work to a quarter of a millimetre we are being very precise indeed. One must be German working metal, serious and constantly aware, but one can be Italian with wood. The advent of high speed woodworking machines has eroded some of this old distinction but much of it still remains, particularly if one pursues it for the beauty of the result rather than commercial gain. Wood is organic, warm and forgiving. It becomes beautiful when finished in ways impossible for metals. Fancy metalwork often looks rather bling, fancy woodwork just looks great. Working it involves long periods of Zen like calm, time without conscious thought. The nearest to it is practice of a musical instrument. The shutting off of all the buzz of normal thought, the worries and concerns of the days, submerged in the calm water of the moment. These two activities are my meditation and I always know when life is in bad shape because I can't find time for them. I enjoy the design of furniture, although it is a new area for me. I am heavily influenced by the Arts and Crafts movement from the late nineteenth and early twentieth century, particularly the early work of Gordon and the other 'Cotswold School' makers. I dislike the direction that furniture design took later in the twentieth century. It was driven by new techniques, primarily those of machine based manufacture and new materials such as laminates. The resulting effect was to remove the very craftsmanship that makes fine woodwork so lovely to behold. Even woodturning suffered as automatic lathes, that can only work the dull woods with no interesting figure in the grain, came to dominate. And I regard the influence of the Bauhaus on furniture as almost universally malign. If I had been born in 1920 I would certainly have been considered a reactionary old duffer. Hopefully the advent of 3 axis CNC woodworking machines, just starting to appear in commercial factories, will finally free us from the tyranny of straight lines, scribed and tenoned panels, steam bent plywood, chrome pipes and all the other cliché's of the 20th century. One of the very positive signs recently has been a veritable renaissance in the availability of high quality hand tools. 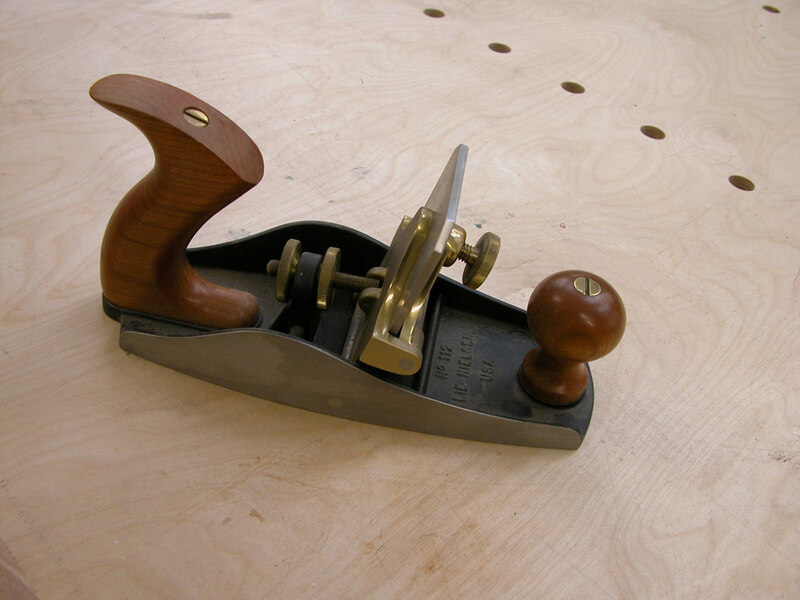 I recently bought a new pair of planes, a Lie Neilson Jack Plane and a great Scraper Plane (immensely useful when working with highly figured timber). Veritas have also been making some nice bits of equipment. I really like their bench dogs. Three years ago I had to take my woodshop apart in order to accommodate my Recording Studio (my wife acquired a grand piano and threw me out of the music room in the house for lack of space and, I suspect, elegance). It sat as piles of sad looking tools and machines in my barn for eighteen months until I finally cracked and built a new space from scratch. This took a long time and is now nearing completion. I have treated myself and now have proper extraction (no more coughing up sawdust, hurrah). Now that I have access to three phase power I have upgraded my old Kitty planer/thicknesser for a wider, better SCM unit. I also have a woodstore in the roof, so my timber will finally actually be properly dry when I use it. 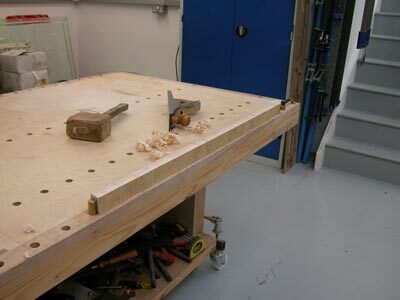 About the only thing that I have made in there so far has been my new workbench, but I am looking forward to cracking on this winter. My daughters have requests in for beds, and my wife Isabel wants a seven foot four poster bed to replace the five footer I made a few years ago, so I suspect I'm going to be busy. Woodturning is one of the easiest and most rewarding ways to play with timber. I have one of the Record CL3 lathes, which is the old Myford ML3 lathe recreated after they bought the company. It has adjustable phosphor bronze taper bearings so that one can get absolutely all the play and judder out of the movement. I can heartily recommend this machine. The newer CL4 comes with a full varispeed, electronically controlled motor so you don't have to mess about with belts when changing speed, which sounds nice. A couple of spare hours in an evening and one can turn out surprising useful finished results, from cheaply available offfcuts. One of the things that I particulalrly like are the old-fashioned finishes. It is hard to beat one of the oldest finishes that there is, hand rubbed linseed oil followed by a mixture of Carnauba and Beeswax. Virtually no-one uses this now, and having applied it a few times I know why. We know it will last well for many centuries as it is the finish routinely used on fifteenth and sixteenth century furniture, before the advent of Shellac based French Polish and Varnish. But it is a nightmare to apply properly, it is very hard work and takes a long time. Making that bed, it took me over two months to apply the finish. I estimate around sixty to seventy hours of work, spread over that period, in five hour stretches. Why? Well, if you are feeling a bit mad and want to have a go, here's how. 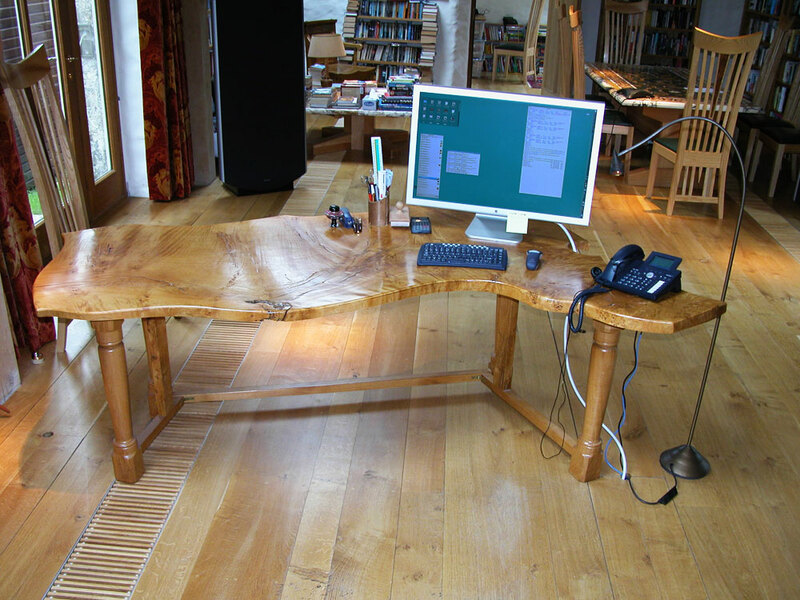 One has to apply from eight to ten coats of linseed oil, followed by five to six of wax, very very thinly. The wax is quick. 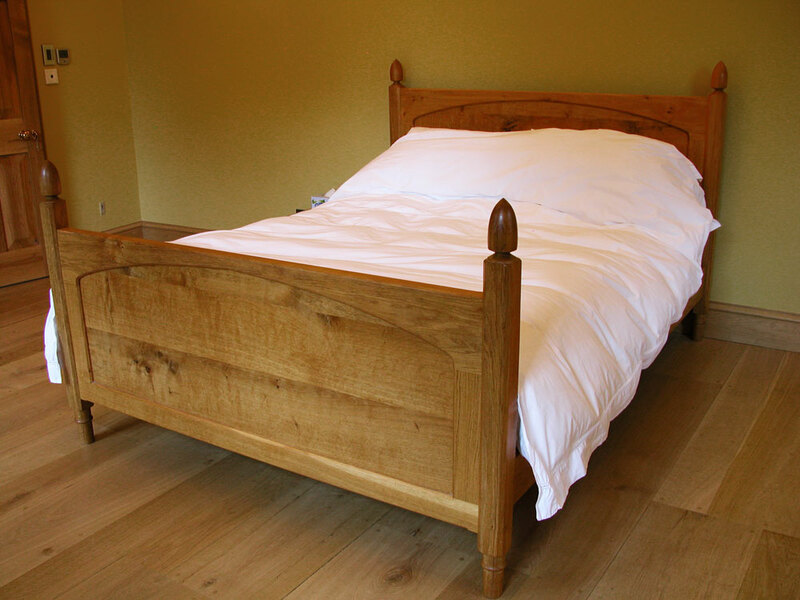 The linseed oil is not, particularly if you are finishing an open-grained wood like oak. The trick is to fill the grain of the wood, and in order to do this we wet sand the piece, producing a slurry of wood dust and oil that gets rubbed into the wood, acting as filler. Using a raw linseed oil (the stuff described as 'boiled' isn't, it just has catalytic agents included that promote the polymerisation, or drying, of the oil when it meets air – combined with the tannins in the oak this will make it go off too quickly and not penetrate the wood well), start with 120 grit paper and wet sand the whole work, creating a slurry on the surface that gets rubbed in as you go. Don't wipe it off until it has stiffened a little, say a day (no more) later. Leave the whole thing for a week to allow the linseed oil to properly polymerise. Then repeat multiple times, using a finer paper each time. Around 240 grit, you'll need to switch to 'wet and dry' paper, used by car body repairers. If the grain is not filling well, go back a grade or two and repeat. I stopped at 800 grit, you know when you're there because the wood will feel like silk, be beginning to take a shine and the grain will be as filled as you want. You now have a wood surface that is basically impregnated with polymerised linseed oil, ie, plastic. To really finish it either make or purchase a good furniture wax (Mylands sell a nice one in the UK) and in very fine coats applied with a soft cloth and polished immediately, apply four or five coats. Don't use a coloured wax or one with any modern additives like silicones, you don't need them as your finish is already there in the oil, the wax is just another protective layer that adds a nice depth. This is a finish that you know will last for five hundred years. I used a modern, acid catalysed finish on this desk. A couple of hours after it is applied one can pour boiling water on it, and in use it is a tough as old nails. Somehow never as attractive as oil and wax, but very very practical. 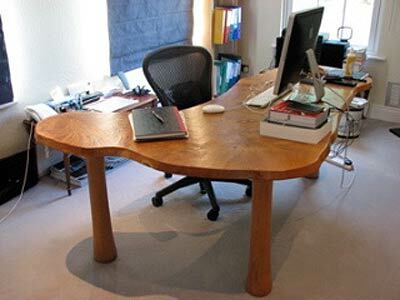 When I bought the wood for the top of this desk, I bought three 2” thick leaves. I gave one to my friend and business partner Simon Hampton who commissioned a local cabinetmaker, Peter Sings to make a desk for him. When I made my desk I spent ages, days, with planes and scrapers getting the surface smooth. Pete was much smarter, he went and hired an industrial floor sander, put the wood on the floor and sanded it flat in about an hour. Peter and I have collaborated on several furniture designs recently. He is an excellent cabinetmaker with a good eye for proportion. 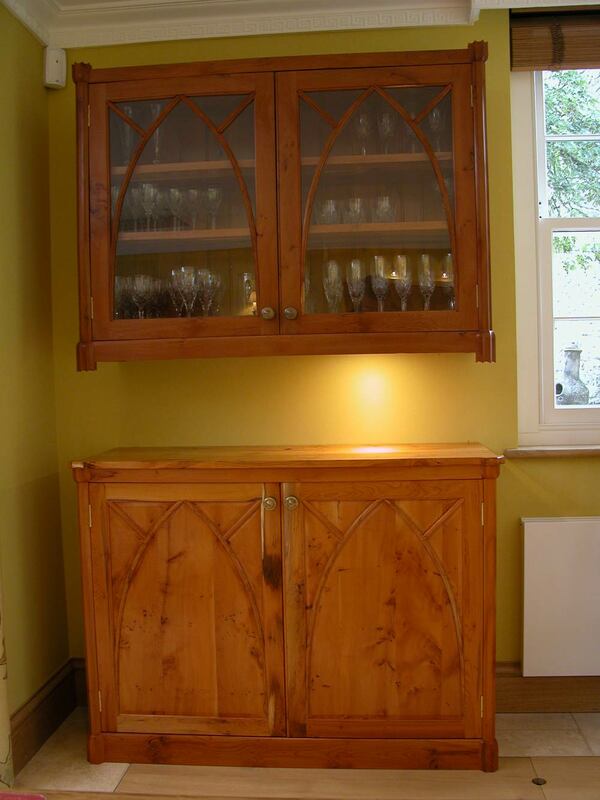 Influenced by Ruskin's 'Gothic Revival' imperative, we designed, and he made, these wall cabinets in English Yew. Our next project together is new bookcases for my Library (which has got beyond 10,000 books now, so it's going to take him a while). Having written this I am now filled with the desire to rush out to my woodstore and tuck into some of that very nice Cherry that I recently acquired. But it is summer and for once the sun is shining. Somehow, working with wood always seems to me to be a thing of the winter, of early evenings and howling gales, snug in a warm workshop surrounded by shavings. Roll on November. – Neville Shute was one of the founders of Airspeed, an aircraft manufacturer that eventually became part of British Aerospace. He wrote about this in his autobiographical 'Slide Rule', still in print and highly recommended reading.